East and West Flower Garden Banks (EFGB and WFGB) were designated as the Flower Garden Banks National Marine Sanctuary (FGBNMS) through the National Oceanic and Atmospheric Administration (NOAA) in January 1992. In 1996, a third bank, Stetson Bank (not a true coral reef), was added to the Sanctuary. It is located about 30 miles northwest of the West Flower Garden Bank. Because of a number of factors, including geographical isolation and water temperature, there is a relatively low biodiversity of reef-building corals inhabiting these banks. 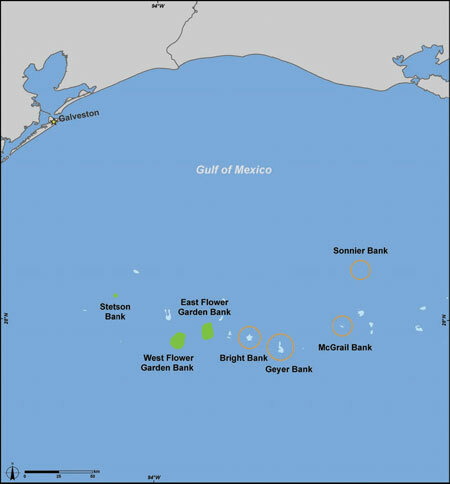 The Flower Garden Banks, which encompass a variety of habitats, including the northernmost coral reefs in the continental United States, are located near the outer edge of the continental shelf in the northwestern Gulf of Mexico, approximately 120 miles southeast of Galveston, Texas. These banks, created by the uplift of underlying salt domes, rise from depths of over 330 feet to within 56 feet of the surface. They are relatively isolated from other Caribbean and Gulf of Mexico coral reefs. The nearest reefs are 400 miles away in the Gulf of Mexico off the coast of Tampico, and over 745 miles from the coral reefs of the Florida Keys. The complexity of habitats supports a diverse assemblage of organisms including approximately 250 species of fishes, 23 species of coral, and 80 species of algae in addition to large sponge communities The predominant coral species at the East and West Flower Gardens are massive, closely-spaced boulder and brain corals and mountainous star corals. Coral growth is relatively uniform over the entire top of both banks, occupying the bank crests down to about 50 meters. The prevalent species at Stetson Bank are smaller encrusting corals, such as fire coral (not a true coral) and green cactus coral. In addition to the coral reefs within the FGBNMS, there are a number of other reefs and banks in the northwestern Gulf of Mexico that contain corals or coral communities. Some contain significant communities of deep water corals in depths from about 200 to 500 feet. The coral reef ecosystem at the FGBNMS has been described as being relatively pristine and thiving, as compared to other Caribbean reef systems, despite its location in the middle of one of the largest oil and gas fields in the world. 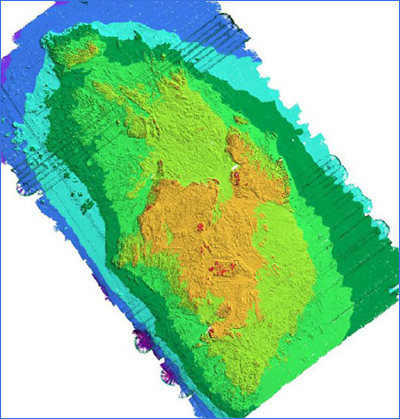 Several reefs and banks in the vicinity of the FGBNMS also harbor deep water coral communities. These banks include Bright, Geyer, Sonnier, and McGrail Banks. Texas Automated Buoy System (TABS). Texas A & M University’s Geochemical and Environmental Research Group (GERG) operates two data buoys near the Flower Garden Banks National Marine Sanctuary at Sites N and V. The buoys measure winds, air temperature and humidity, atmospheric pressure, conductivity, and surface currents and report the data in near real time through the Texas Automated Buoy System.